The benefits of forard-swept wings (FSW) have been known since World War II, offering enhanced agility, virtually spin-proof handling, lower drag, better low-speed flight and lower stalling speeds. But early efforts were defeated by aeroelasticity- the tendency of wings to twist under normal flight loads. Practical designs had to wait until the strenght of available structural materials caught up with theory. After years of work on FSW design, Grumman won a 1981 contract to build two X-29 research planes. The company slashed manufacturing costs by using parts from many aircraft-F-5 fuselage and nosewheel, F/A-18 Hornet engine and F-16 main undercarriage. The result was more than the sum of its parts. 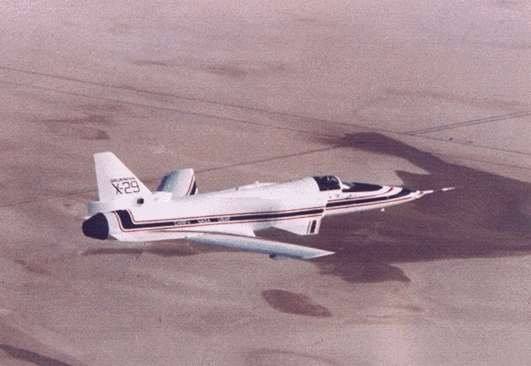 In several years of experiments, the X-29 demostrated an ability to maneuver at angles of attack as high as 67 degrees, and showed that FSW configuration can result in large fuel savings. Test pilots found the X-29 exciting to fly. With its wing shape and agility, it gave meaning to the motto on a sign at Edwards Air Force Base: "Toward the Unkown." Today the X-29 has been retired, but its contribution to aviation is very much alive.